The state of Alaksa is known for it crabbing industry, and is responsible for producing one third or more of the total crab caught in the US. There are actually over 80 species of crab in Alaskan waters, but only a few of the species have commercial importance. The Bering Sea, Aleutian Islands, and the Gulf of Alaska are the bodies of water in which most of the Alaskan crab comes from. Some of the most prevalent types of crab in Alaska include the Alaska king crab, hair crab, tanner crab, and the Dungeness crab. King crabs are one of the primary crabs caught in the fishing industry and are considered to be the most valuable. There are actually several species of king crabs in Alaska, such as red king crabs, blue king crabs, golden (brown) king crabs and scarlet king crabs. Red and blue king crabs are both found at less than 180 meters deep. The red crabs are widely distributed throughout the waters around Alaska while the blue king crabs are found in small populations in isolated cold water areas. The golden crabs are primarily located in the Aleutian islands while the scarlet king crab is found in deep waters and is normally a by-catch of Tanner crabs. There are two types of tanner crab prevalent in Alaska, the bairdi and the opilio tanner crab. The opilio crab is often times referred to as snow crab. Tanner crabs became popular to catch in Alaska when there was a shortage of king crab. 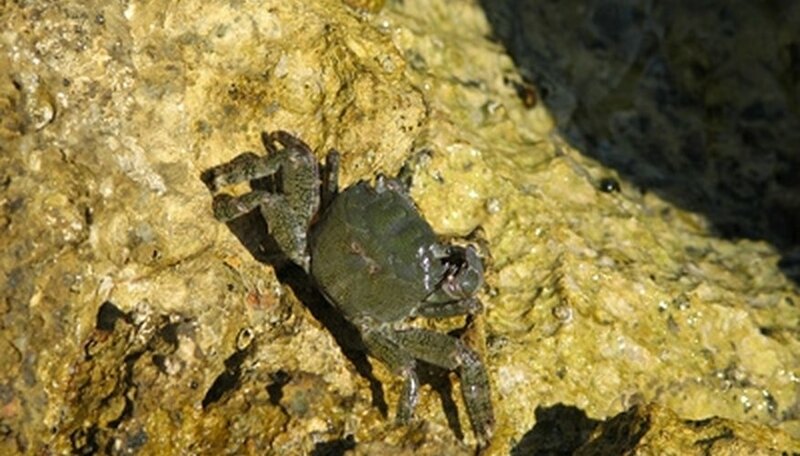 The tanner crabs are found in deeper waters at no less than 300 meters. The Dungeness crab, also known as Cancer magister, is not solely located in Alaskan waters, but can be found down the Pacific coast all the way to Mexico. Dungeness crabs are most often found in shallow waters and at the mouths of rivers. The hair crab, also known as Erimacrus isenbeckii, is a crab not as well known as the others, but still has commercial importance to the crabbing industry in Alaska. Hair crabs are most often found near the Pribilof Islands in Alaska. What Is a Jonah Crab? Armstrong, Reese. "Types of Crab in Alaska." Sciencing, https://sciencing.com/types-crab-alaska-7821009.html. 24 April 2017.